Five women, including the wife of the jailed leader of the People’s Committee against Police Attrocities (PCPA), Chhatradhar Mahato, are amongst those seeking meetings with Mamata Banerjee, the newly- elected Chief Minister of West Bengal, when she tours Jangalmahal soon. Mahoto’s wife, Niyati, is hopeful of securing a meeting with West Bengal’s first-ever female Chief Minister. 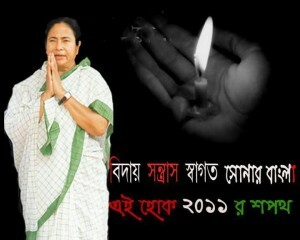 “If given a chance, I would like to meet Mamata in person. “I would tell her that my only demand is my husband’s release. “He has been in jail for two years and the state government can do whatever it deems fit to secure that. “For two years my husband is languishing in jail. We are finding it very difficult to make ends meet,” said Niyati. Niyati acknowledged the road ahead could be rough, but said government representatives had met with her husband in prison and she urged it to spell out its intentions.